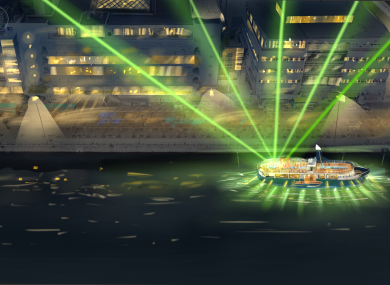 How the boat would look on the Liffey. DUBLIN CITY WILL get a new hotel on the River Liffey. The hotel will be based in national heritage ship PS Naomh Eanna, which has been given a licence to berth on the city’s river at Custom House Quay. The licence comes as part of the Docklands water animation strategy. Businessman Sam Field Corbett, whose company also restored Dublin landmark the Cill Áirne, had been attempting to save the Naomh Eanna by putting it in Galway, but that plan would not come to fruition. Field Corbett’s company also owns both Grand Canal passenger barges and the Escape Boats attraction. Once used to carry passengers and supplies between Galway and the Aran Islands, the Dublin-built ferry has been berthed in the city’s Grand Canal Dock since 1989. After falling into disrepair, she had been due to be scrapped by Waterways Ireland when safety concerns were raised in a hull inspection. A render of how the boat will look. After years of efforts a berth in the river and private funding of €6.6 million to restore the ship and refit her as a 28-bedroom hotel. The hotel will have a glazed restaurant on the boat deck. The campaign group says it will “represent the ship building legacy of the Dublin Port area and will recall her past service to the Aran Islands from Galway”. The group hopes the works will be carried out in the 250-year-old Ringsend Graving Docks and will take nine months. Email “Former Aran Islands ferry to be transformed into floating Liffey hotel ”. Feedback on “Former Aran Islands ferry to be transformed into floating Liffey hotel ”.